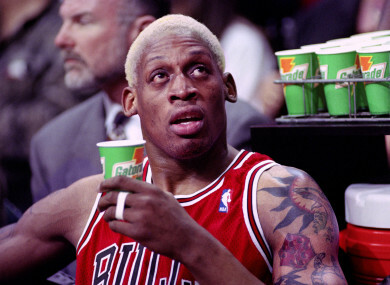 Dennis Rodman features in this week's best sportswriting. 1. “THE GREATEST GOALKEEPER of them all, Lev Yashin revolutionised his position and became a hero of the Soviet Union. This summer, the image of him flying high will be seen by millions of people because it is Yashin who is on the 2018 Fifa World Cup poster. In Yashin,Patrick Jennings and the BBC take a closer look at the poster boy for this year’s World Cup in Russia. 2. “When you hear Dennis Rodman’s name, what—or more accurately, who—do you think of? Sports Illustrated’s Chris Ballard examines the complicated legacy of Dennis Rodman and how his post-career antics have shaped our memories of him as a player. 3. “Doubt settles over Neville Southall like a brooding cloud on an otherwise sunny afternoon in Liverpool. One of the best in the business, Donald McRae has a fascinating chat with Neville Southall in The Guardian. 4. “At a few minutes past 5:30 on the afternoon of June 9, 1973, Charles (Chic) Anderson raised binoculars to his eyes and prepared to call the 105th running of the Belmont Stakes. He was 41 years old, married with five children, living an itinerant life that took him away from the family home in Evansville, Ind., for weeks at a time, but one which he clearly loved. Tim Layden breaks down one of the most famous pieces of horse racing commentary for Sports Illustrated. 5. “Speak to those who saw Kylian Mbappé as a child, who watched him take the first steps in his skyrocket of a career, and they will tell you the same thing: All they needed was one glimpse. That was enough, even then, to know. French sensation Kylian Mbappé gets the New York Times treatment from Rory Smith and Elian Peltier ahead of the World Cup. 6. “The four-star Forrestmix Hotel just outside St Petersburg, where England’s footballers will be based during this summer’s World Cup 2018, boasts 107 plush rooms, gym facilities, a pool, a VIP spa, three restaurants and a helicopter pad. The players will be able to fill their downtime with myriad forms of entertainment – laptops, tablets, games consoles, box sets – whilst theoretically keeping in touch with the rest of the world via their smartphones. The second part of Jonathan Liew‘s sit-down interview with Gary Lineker went live this week in The Independent. Email “The man who revolutionised goalkeeping, Dennis Rodman's genius and the week's best sportswriting”. Feedback on “The man who revolutionised goalkeeping, Dennis Rodman's genius and the week's best sportswriting”.